Human chorionic gonadotropin (hCG) is a glycoprotein hormone produced by the developing placenta shortly after fertilization. In normal pregnancy, hCG can be detected in both urine and serum as early as 7 to 10 days after conception (1-4). hCG levels continue to rise very rapidly, frequently exceeding 100 mIU/mL by the first missed menstrual period (2-4), and peaking in the 100,000-200,000 mIU/mL range about 10-12 weeks into pregnancy. The appearance of hCG in both urine and serum soon after conception, and its subsequent rapid rise in concentration during early gestational growth, make it an excellent marker for the early detection of pregnancy. The One Step hCG Single Test Card is a rapid test that qualitatively detects the presence of hCG in urine specimen at the sensitivity of 25 mIU/mL. The test utilizes a combination of monoclonal and polyclonal antibodies to selectively detect elevated levels of hCG in urine. At the level of claimed sensitivity, the One Step hCG Single Test Card shows no cross-reactivity interference from the structurally related glycoprotein hormones hFSH, hLH and hTSH at high physiological levels. 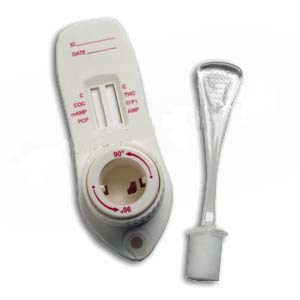 A rapid, one step test for the qualitative detection of human chorionic gonadotropin (hCG) in urine. For professional in vitro diagnostic use only. The One Step hCG Single Test Card is a rapid chromatographic immunoassay for the qualitative detection of human chorionic gonadotropin (hCG) in urine to aid in the early detection of pregnancy. The One Step hCG Single Test Card is a rapid chromatographic immunoassay for the qualitative detection of human chorionic gonadotropin (hCG) in urine to aid in the early detection of pregnancy. The test utilizes a combination of antibodies including a monoclonal hCG antibody to selectively detect elevated levels of hCG. The assay is conducted by immersing the strip of the test card in a urine specimen and observing the formation of colored lines. The specimen migrates via capillary action along the membrane to react with the colored conjugate. Positive specimens react with the specific antibody-hCG-colored conjugate to form a colored line at the test line region of the membrane. Absence of this colored line suggests a negative result. To serve as a procedural control, a colored line will always appear at the control line region if the test has been performed properly. •For professional in vitro diagnostic use only. Do not use after the expiration date. •The test card should remain in the sealed pouch until use. •All specimens should be considered potentially hazardous and handled in the same manner as an infectious agent. •The test card should be discarded in a proper biohazard container after testing. Store as packaged in the sealed pouch at 4-30°C. The test card is stable through the expiration date printed on the sealed pouch. The test card must remain in the sealed pouch until use. DO NOT FREEZE. Do not use beyond the expiration date.